If you know my past with Legacy decks, you know my love for Stoneforge Mystic. I LOVE me some Squires that occasionally draw you a card. Personally, math is hard, and attacking for five is really easy. Being a fan also gives me pause when decks like this start to do well. For example take Harlan Firer’s Azorius Delver deck he’s been playing to some success. However, outside of Harlan I haven’t seen the deck perform. I think the deck is flawed. It was in a good position since it could switch between so many different roles; but, with the format becoming more focused, it’s more important than ever to have a gameplan well-suited to the metagame. Stoneblade has always been a good deck in focused formats, and it’s going to be especially well positioned when there’s a bunch of Delver of Secrets around. While I still think Death and Taxes is a solid strategy, the combo decks can overpower it sometimes. If faster combo decks rise again, then Taxes will fall into a worse position. Stoneblade often feels like a ‘better’ Taxes deck, since having Force of Will feels like a fantastic check against the combo decks. Taking a look at events it’s fairly easy to see Delver strategies are on the rise. With so many different flavors available it’s easy to see why the deck is popular. It appears the Blood Moon/Chalice decks and Death and Taxes are on the rise as well. With combo decks moving to slower strategies like Sneak and Show and ANT, I’m starting to agree with Omar Beldon that Stoneblade is well positioned again. Let’s take a look at his decklist and break down his choices. This specific variation was piloted by Gul_Dukat to a Challenge win after going 13-2 in Leagues; an impressive feat. While some of the choices may seem odd at first blush, there is some solid reasoning underlying them. Starting with the spells, we see a mass of cheap interaction. Most of the Delver decks have important threats in the 2-drop slot; cards like Dark Confidant and Young Pyromancer have dominated as choice build arounds. Then you have cheap and massive beaters like Pteramander and Gurmag Angler that are likely to be impactful in the mid to late game. Playing Swords to Plowshares means you’ll always have some of the best and cheapest answers to these cards. Similarly, True-Name Nemesis is an incredible creature and jamming four in your deck means you’ll always have one and care less about the first copy resolving. With five virtual copies of Umezawa's Jitte in your deck it’s even easier to assemble an incredible combo to devastate any creature deck. Against combo decks, having Spell Pierce and Counterspell provides enough early interaction to mimic a Delver deck and keep a combo deck off balance just long enough to execute your game plan and win. 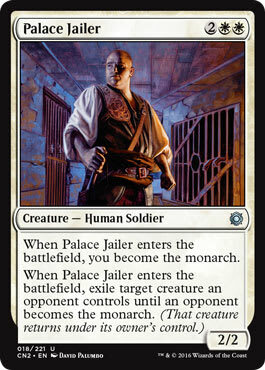 The secret best card might just be Palace Jailer. A few months ago, at a team open during week one Standard for Guilds of Ravnica, I questioned why the Miracles lists didn’t have Palace Jailer in them yet. My point of contention was twofold: 1) Miracles is so good at answering the board (as is Stoneblade) and, 2) it’s hard for a deck to steal the Monarch, so it is relatively easy to accrue a mass advantage. One of the (very few) downsides to Jace, the Mind Sculptor is one attack or a Lightning Bolt generally beats it. With Palace Jailer, you get a removal spell that doubles as card advantage immediately. Against decks like Lands or Depths where it’s hard (or impossible) for them to take the Monarch from you, you end up overpowering everything they do while being able to out draw them. Being a creature means it will always be able to pick up an equipment, adding extra value to your draw steps. While I do wish Jace was somewhere in the 75, I completely understand the reasoning for its absence. This isn’t even taking into consideration the sheer amount of Pyroblasts hanging out in the sideboards of every deck. Continuing on the trend of mimicking a Delver deck, in the sideboard we see four Delver of Secrets. Delver of Secrets is certainly NOT a sideboard card, but here we see it just hanging out in the fifteen. The reason for this is actually where a lot of the genius comes in. Playing a focused deck like Stoneblade, and not Delver, means you can eschew cards like Daze in favor of more impactful counters or permanent hate, and you have a concrete game plan. However this means your clock is often quite slow. Trying to kill your opponent with Squire and a three-mana creature does not close the game out and help you keep up interaction. Boarding into Delver against combo decks or Miracles gives you a faster clock backed up by a ton of pressure. Having 26 spells in the deck means your Delver is very likely to flip, so it makes this board plan entirely reasonable rather than a pipe dream. While most of the time it’s an easy switch of cutting on True-Names, sometimes there will be others moving out. Another card in the sideboard I’m a big fan of is Tormod's Crypt. Most graveyard based decks plan to use discard to play around Surgical Extraction. Utilizing Tormod's Crypt means even though your opponent has perfect information it will be harder to play around or use discard as a set up. And there you have it. With the flexibility of having excellent answers against the creature decks and a good sideboard plan against the slower combo and control decks, Azorius Stoneblade is well positioned in the current Legacy landscape. Give it a shot and let me know what you think in the comments or on Twitter.